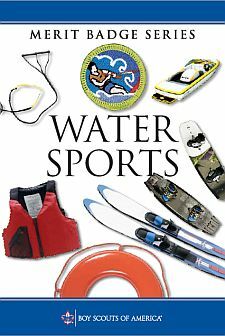 These requirements were first published in the 2015 edition of the Water Sports merit badge pamphlet. They were also published in the 2016 edition of Boy Scout Requirements, but the badge was not identified as having changes. Starting from outside the wakes, show you can cross both wakes four times and return to the center of the wake each time, without falling. Show you can fall properly to avoid an obstacle. Also show that you can drop handle and coast to a stop without losing your balance.